Mar. 27 Update: Doubling down on doubling funding. Where $600M might come from. On March 21, the government announced it is enhancing the Ontario Autism Program. Our website will be updated soon to provide additional information. The new Ontario Autism Program goes into effect on Monday. Question Period has been unusually useful this week. Once again, NDP MPP Monique Taylor (Hamilton Mountain) asked a question about layoffs at autism service providers, and once again PC MPP Lisa MacLeod (Nepean) called such layoffs “premature” and that government is “ encouraging agencies to find a better way”, though no indication was given on what form this “encouragement” is taking. And just yesterday, I met with Autism Ontario to prove we are reaching out and we are listening. We signed a $750,000 contract with Autism Ontario yesterday so that they can continue to work with parents as we navigate through this new system. We are going to enable and empower families to have a childhood budget where they will work with Autism Ontario, which we signed a $700,000 contract with to help navigate the system so moms and dads can best utilize that support. Are these two separate contracts? Is this an additional $750,000 on top of the $700,000 that was announced in February? If this isn’t two separate contracts, then when was this contract signed and how much was it for? $700,000 or $750,000? Let me be perfectly clear: Under the previous Liberal administration, they spent $256 million on autism. Under the Ontario Progressive Conservative Party, that will be over $600 million. Allison Jones of Canadian Press wrote a piece on the $600 million pledge. Recommended reading. We shouldn’t have to speculate on what the government has in mind — they should release a detailed plan with a full costing that we can analyze. But they have consistently left parents, service providers, the media in the dark. So all we can do is guess. What follows is purely speculative. Please don’t quote this and say “Mike says this is what the government is doing”. I don’t know what the government is doing. I don’t think the government knows what the government is doing. Remember we’re still in the “nobody knows much of anything” phase of the roll-out. The hope is, of course, that the government is adding $300 million in “new” money to the program. Given the government’s other priorities (like reducing the deficit), this strikes me as incredibly unlikely. I don’t even think it would be that useful. The problem with the government’s OAP reforms is how wasteful it is. Doing nothing but increasing the budget would simply be forcing more water down a leaky pipe. There’s also been speculation that the extra $300 million is simply a one-time increase, to help “clear the waiting list”, then the budget would return to $321 million. This also strikes me as unlikely. I don’t think the government has even $300 million for a one-time payment, and I don’t know what a one-time increase would accomplish. What would that money even get spent on? There’s a pretty limited number of therapists (and if anything, that number is shrinking due to the layoffs). So I don’t think this is it either. I believe they plan on consolidating a bunch of existing programs into a new “super” OAP. This would include the existing OAP, the “autism” portion of Special Services at Home (SSAH), who knows what else. I’m sure with a bit of brainstorming we could come up with a list. It explains where the money is coming from — most, if not all of it, would not be “new” money, but rather existing spending under a new name. It explains what the government has in mind for SSAH. We understand that the Ministry is waiting for information that will be released as part of the Provincial Budget on April 11 before issuing any authorization letters. 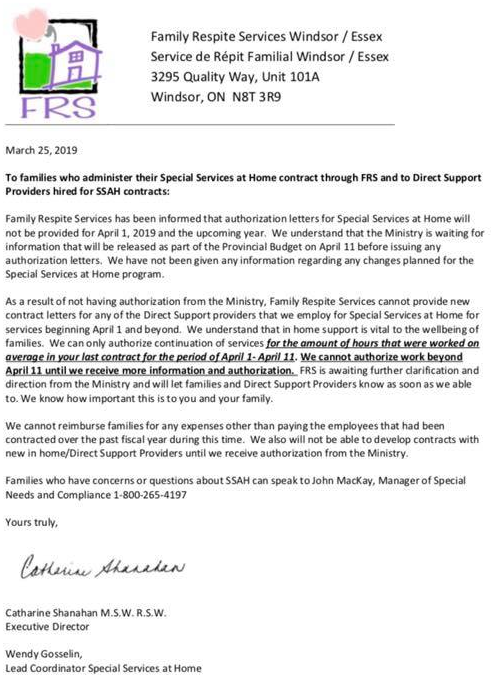 We have not been given any information regarding any changes planned for the Special Services at Home Program. So that’s how you get to a $600 million OAP. Take $320 million from the existing OAP, some money out of SSAH (it couldn’t be all of SSAH, since it serves a much larger population than kids with autism) and a few other programs, and you have a new “super OAP”. It wouldn’t be so much changing the services that the government provides parents, but it would be combining them into a single program. It also has the side-effect of making it look like you’re spending “new” money, rather than just re-allocating existing money. If that’s what the Ontario government has in mind, there’s a fair bit of precedent for it. The federal Liberals introduced a new Canada Child Benefit (CCB), which was mostly a consolidation of three existing programs: the Universal Child Care Benefit (UCCB), the federal Canada Child Tax Benefit (CCTB) and the federal National Child Benefit Supplement (NCB), along with some additional “new” money. (Note: I was an economic advisor to Justin Trudeau prior to the 2015 election, and played a minor supporting role in the design of the CCB). In general, I’m a fan of these types of consolidations. Governments of all stripes have a nasty habit of introducing new programs which overlap with existing ones, causing duplication and waste, and make it difficult for citizens to navigate the system. One example came last week from Sean Speer, who noted that “the federal government is currently administering 106 active labour market programs across 30 departments totalling $7.5 billion per year.” There’s opportunities for both the federal and provincial governments to consolidate programs, to provide better services to citizens and reduce waste. That said, governments need to proceed carefully and deliberately when consolidating. They need to work with stakeholders to design the best programs possible. They need to ensure the transition from the old programs to the new is seamless. Finally, they need to be transparent about what they’re doing, if for no other reasons than to reduce anxiety and help families plan. The Ontario government is doing none of those things with SSAH. Everybody is being left in the dark and families are scrambling to figure out how they will get the help their kids need. I can’t tell you how many panicked emails and phonecalls from crying parents I’ve received. The rollout of these new programs has been a toxic stew of incompetence and cruelty. Doug Ford and Lisa MacLeod need to do better. Program details from the Ministry of Children, Community and Social Services. Feb. 6 Press Release: Helping Families by Improving Access to Autism Services. Feb. 6 Press Release: Ontario Takes Decisive Action to Help More Families with Autism. Feb. 6 Press Release: Electronic Press Kit Now Available: Ontario Takes Decisive Action to Help More Families with Autism. Feb. 7 Press Release: New Ontario Autism Program Draws Support From Across the Province. Mar. 11 Press Release: Ontario Continues to Support Students with Autism. Mar. 22 Press Release: Ontario Enhancing Support for Children with Autism. Senior Director, Smart Prosperity. Assistant Prof, Ivey Business School. Exhausted but happy Dad of 2 wonderful kids with autism. I used to do other stuff.